Hi, Friends! I am excited to introduce you to you my blogging friend Crystal. She has this great food blog called Simply Playful Fare where she shares some of the most awesome (healthy) recipes. I thought you might like to meet her, so today she is going to guest post on my blog. You see, I am traveling (again) and blogging gets a little hectic when I am on the road. I like to keep up regular posts, so Crystal is saving the day by writing this post for me today. But first, a short story. I don't love work travel. I don't love being away from my husband. He tells me that Ollie walks around the house looking for me in every room the entire time I am gone. You may know that the Walking Dead mid-season premier aired this Sunday. We don't have cable at home, so if there is one small benefit to work travel, it is hotel cable. A quick scan of the TV station list and AMC is listed. WOOOHOOOOO!!! It's 8:30 on Sunday night and Gilligan's Island is on the station that is labeled as AMC. Seems weird, right? Not exactly the build up to the zombie apocalypse that I would expect, but I held on to hope. You know what came on at 9? The Golden Girls. Kind of the Walking Dead, but not exactly the one I was expecting. (Yes, I think I am hilarious.) Hopes and dreams crushed. No one tell me what happens. Faces get eaten? People die? Zombies get stabbed? Darryl's still cute? I don't want to know. I'll catch up once I get home. Crystal wrote a post about Blueberry Almond Quinoa. In case you were wondering how to pronounce quinoa? KEEN-Wah. You're welcome! This recipe looks so easy, even I could do it! If breakfast is the most important meal of the day, why is it sometimes the most neglected meal? If you’re like me, mornings are the toughest time of my day. I’m not a morning person because I don’t wake up well. So it’s important, if not imperative, for me to be prepared. The easiest way for me to be prepared is to make a big batch of breakfast, whatever I feel like eating for the week, and store it in the fridge at work. This week, the big batch is quinoa. As my husband said, quinoa is the new oatmeal, and with good reason. It’s gluten free, has a ton of protein, and can be flavored just about any way you want. This recipe calls for almond milk, blueberries, and almonds, but you can substitute regular milk, soy, any kind of berry, and any kind of nut that you like. 1. Add the quinoa and almond milk to a medium sauce pan and bring to a boil. Reduce heat to a simmer and cover. Cook the quinoa for about 15-20 minutes, or until the liquid has been absorbed and the grains are translucent. The quinoa boiled over on me twice during cooking. To avoid this fate yourself, make sure to watch the quinoa and stir pretty vigilantly. 2. Add the vanilla extract to the cook quinoa, stir and let cool. 3. If you are using frozen blueberries, rinse in a colander to thaw before eating. 4. Add the quinoa to a large Tupperware or container. Add the blueberries and the almonds. Serve alone or with a splash of Almond Milk. This recipe is designed to be taken with you to work. If you are organized enough to have breakfast at home, just keep the quinoa in the fridge and assemble a single serving when you’re ready to eat. You should follow Crystal over at Simply Playful Fare and pin a bunch of her recipes. You won't regret it! Thanks Crystal for the recipe and the guest post. Do you love quinoa? the Walking Dead? Are you following Crystal now? Tell me about it in the comments. 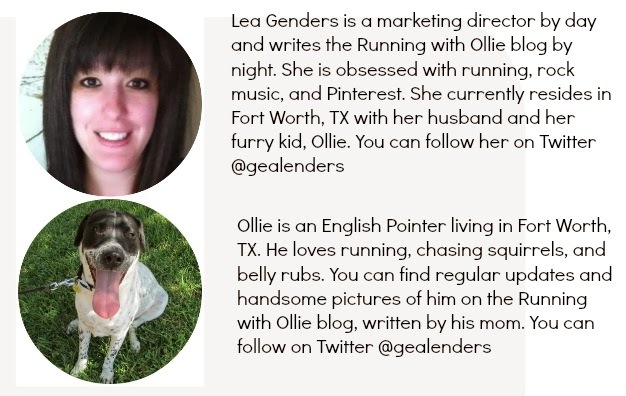 Lea, thank you for letting me share this post on Running with Ollie! yay! thanks for doing it! you rock!